Earn 15 - 550 points upon purchasing this product. Of the 13 vitamins our bodies need, one is B12. It is unique because it is the only vitamin that cannot be obtained from plants or sunlight (as plants do not need B12, so do not produce or store it), it is produced by bacteria in the gut of animals and absorbed in the small intestine. Use 150 - 5500 points to purchase this product! It is remarkably easy to become deficient in B12, as many people can neither absorb nor use B12 due to gut disturbances. Vegans and vegetarians are particularly prone to deficiency. The route that B12 takes from the mouth to the blood is very complex and there can be problems at any point. Which is why sublingual administration can be very effective as it enters directly into the bloodstream. ” A supplement that’s very important for the population is B12, in the form of adenosylcobalamin combined with methylcobalamin or hydroxycobalamin. 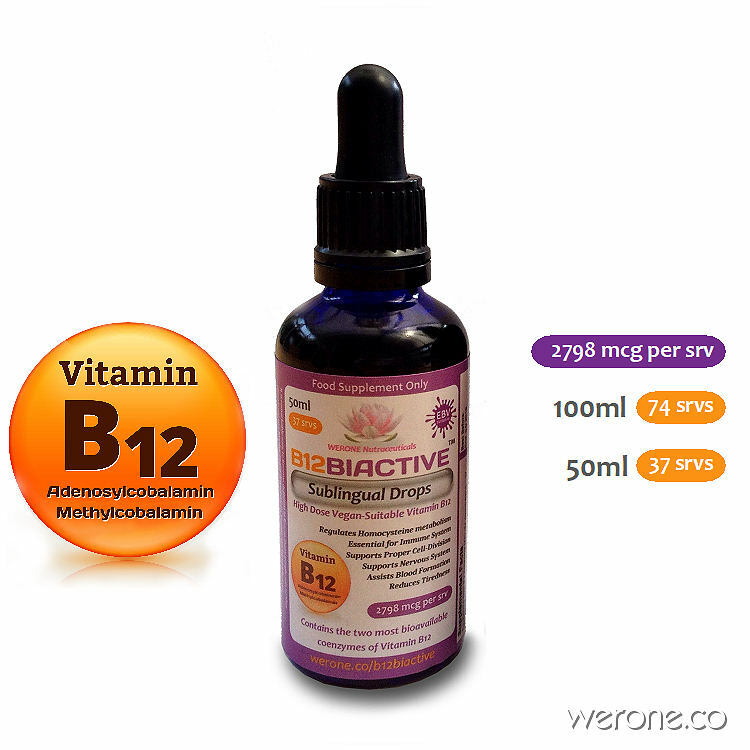 This type of B12 blend has yet to gain much popularity, because very few people know about it. I only know because I am blessed that Spirit is ahead of the times in order to get people what they need. Mark Spirit’s words, this form of B12 will be in every naturopathic doctor’s repertoire before too long. We live in a time of more stress and pollution than ever before in history, and Spirit tells me that wild blueberries and B12 (as an adenosylcobalamin blend) are two of the most important secrets to surviving in the 21st century”. Therefore to obtain B12 from the diet you need to eat animal products- meat, fish or dairy products. However even a diet high in these foods may not supply enough B12. In fact it is remarkably easy to become deficient in B12 as many people can neither absorb nor use B12. Vegans and vegetarians are particularly prone to deficiency. The route that B12 takes from the mouth to the blood is complex and there can be problems at any point. The most-commonly used man-made forms are cyancobalamin, methylcobalamin, and hydroxocobalamin. Hydroxycobalamin is the form of vitamin B12 that the “good” or “healthy” bacteria in your gut make on their own. Methylcobalamin is the form of vitamin B12 that’s the easiest for the body to use. Methylcobalamin is optimally bioeffective. Adenosylcobalamin plays a critical role in mitochondria, methylation tolerance, myelin formation, and neurological health and is often lacking in the diet. The most well studied use of methylcobalamin has to do with sleep. Although the exact mechanism of action is not yet clear, it is possible that methylcobalamin is needed for the synthesis of melatonin. Available information indicates that methylcobalamin can modulate melatonin secretion, enhance light-sensitivity, and normalize circadian rhythm (your 24-hour clock). Because of this, individuals supplementing this form of B12 often have improved quality of sleep, often will require slightly less sleep, and will not uncommonly report that they feel a bit more refreshed when waking in the morning. Methylcobalamin is particularly effective when your 24-hour clock is not running smoothly. Adenosylcobalamin is also an “active” B12 form, making this coenzyme immediately available for use by the body. It is required for an enzyme known as MCM (Methylmalonyl Coenzyme A Mutase), which resides in the mitochondria and is needed to make succinyl CoA to produce energy in the citric acid cycle. In humans adenosylcobalamin is found mainly in the tissues especially the liver. It is the primary form on B12 found in non-human animals. Deficiency of Vitamin B12 There is no one particular symptom that suggests a B12 deficiency. Symptoms may depend on the age and genetic disposition of the individual, and also the length and severity of deficiency. Because Vitamin B12 has so many functions, including the health of nerves, brain, blood and immune system, as well as the formation of DNA, B12 deficiency can impair functioning in almost any part of the body. The following signs and symptoms are common symptoms of B12 deficiency but can also arise from other causes. Mental changes include irritability, apathy, sleepiness, paranoia, personality changes, depression, memory loss, dementia, hallucinations, violent behaviour and in children developmental delay and/or autistic behaviour. Neurological signs and symptoms include pain, tingling or numbness, decreased sense of touch, pain or temperature, weakness, loss of awareness of body position, clumsiness, tremor, symptoms mimicking Parkinson’s disease or multiple sclerosis, spastic muscles, incontinence, paralysis, visual changes and damage to the optic nerve. Other signs and symptoms may include shortness of breath, generalized weakness, chronic fatigue or tiredness, loss of appetite and weight loss, epigastric pain (poor digestion, full or bloated feeling after eating normal or small meals), diarrhoea or constipation, increased susceptibility to infection, poor wound healing, failure of new born to thrive, tinnitus, vitiligo (white patches of skin), or hyper-pigmentation, premature grey hair and impotence. We haven’t changed the B12 formula or the concentration in B12BIACTIVE™, we have now added a pipette to make higher dosages much easier, eg: 2 x pipette squeezes = approximately 2798 mcg (48,632%). You can order a pipette for your bottle (to replace your spray nozzle) on this page. It is advisable that B12 is NOT to be taken with fruit juice or with Vitamin C supplements (see below). Best taken in the morning on an empty stomach with Folate companion 5MTHFACTIVE™ . Using the pipette, squirt 2 x pipette squeezes of B12BIACTIVE™ under the tongue and hold for 30 seconds before swallowing. Do not try to completely fill the pipette, this will create an inaccuracy, just one press of the pipette bulb fills approx half way up the pipette, do this twice and you will have 2798mcg. B12BIACTIVE™ should be supported with Folate and Magnesium supplements. See our MEGA Greens capsules here for the folate. Note: Our B12 is derived from a non-GMO fermentation process and is tested for 100% purity and is free from toxins and free from citric acid. All forms of B12 are stable when protected from the light. Light exposure cleaves the cyanide with the production of hydroxycobalamin. The B12’s have an optimal stability at a PH4.00-4.5, even at higher temperatures. In the presence of acid or alkaline mediator the presence of reducing agents such as ascorbic acid the vitamin is destroyed to a greater extent. It is therefore advisable that B12 is not to be taken with fruit juice for at least 1 hour afterwards. Note: After opening keep refrigerated, potency is maintained for up to 3 months from opening. Great absorption & best price! Everything fine. I am happy with the product. All fine here as well. Arrived quickly and safely and lovingly packaged. So very happy. Everything fine this time with the purchase – nothing broken 🙂 Thanks again for the generous refunding. Love and hugs from Zurich. 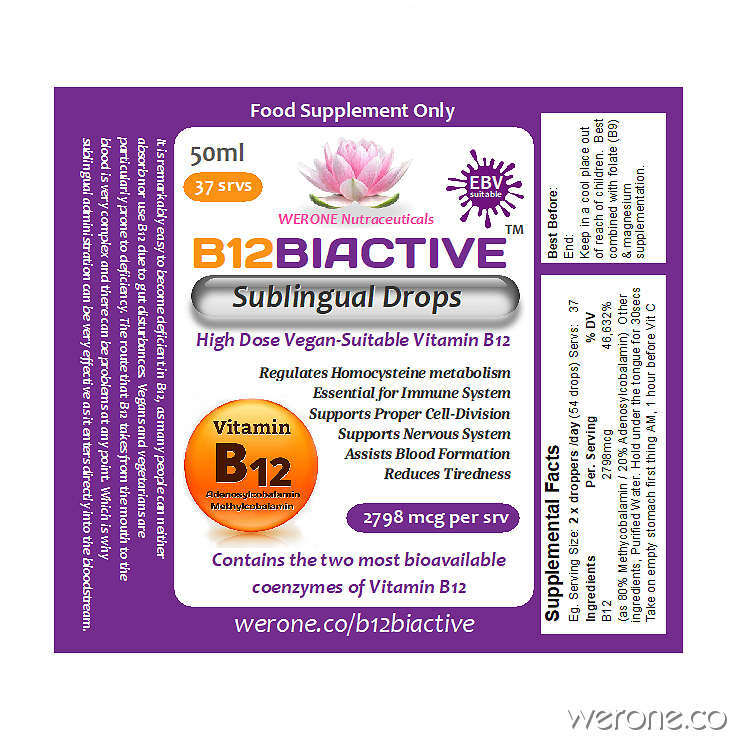 This B12 helps me a lot as I am a Vegetarian. No fever blusters anymore, stronger. Happy with the product and with delivery! Thank you. Good product and fast delivery. Perfect! Nice to have drops instead of pills/tablets. Early days to notice any effect, but I am confident in the products. Excellent product! This time it was delivered after only 7 days by normal post to Switzerland. Super. Excellent product. Excellent service. Will order here again!